UnitDoseOne, which won the Pitchfire startup competition at RoboBusiness 2017, is working to reduce medical errors, improve security, and save lives with its prescription delivery system. Pitchfire attendees and judges alike at RoboBusiness 2017 were impressed by the new robotic pharmacy offering from UnitDoseOne, winners of the annual startup competition. The prescription drug crisis is in a continuous media spotlight, and hospital medication errors quietly claim lives from preventable mistakes in drug dosage and type. The Poland-based company presented a revolutionary new product at RoboBusiness 2017. UnitDoseOne keeps the entire process of transporting a drug from the pharmacy to a nurse, and then to the patient, wrapped up in an automated process that adds a layer of security. With the system, a patient’s information is scanned, and the dispensing machine at the hospital pharmacy places the prescribed drugs inside a Smart Box. It then delivers the medicine to the attending nurse. This Smart Box, which can only be opened by wristbands from the patient and the nurse attending them, can then be brought to the patient, and the patient can be given his or her medication. The only time a human touches the drugs is when the nurse takes them out of the Smart Box and gives them to the patient. 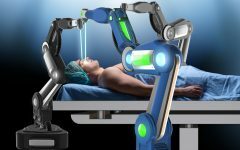 Robotics in the medical field is growing quickly, and while surgical automation is stealing most of the headlines, robotic systems like UnitDoseOne’s will provide real, tangible benefits to the industry in hospital medication errors, better control of prescription drugs, and more lives saved. The company already has a pilot program in a hospital in Poland, and it is scheduled to begin one in the U.S. in the coming year before seeking to bring their product to the open market. AI Workers – Are You Ready to Hire Them?